Q: What is a Report Object in the Object Navigator? Q: What are the types of parameters? Q: What is a user parameter? Q: What is a system parameter? Q: Describe property palette in the report builder. Q: How can you use the "Report Wizard" tool in the "Report Builder" tool? Q: How can you use the "Object Navigator" window? Q: How can you write a report? Q: How can you save a report? Q: How can you use the "Data Model" tool? Q: What is the "Property Palette" sheet? Q: How can you change a report style? Q: Use a tabular style for a report. Q: How can you navigate through your report? Q: How can you change a format mask for an item in the "Report Builder" tool? Q: Your client is a stock broker that keeps track of its customer stock transactions. You have been assigned to write the reports based on their reports layout requirements. For date MM-DD-RR (Year 2000 complaint). 1- Write a tabular report. 2- Apply user layout Format mask. Q: How do you use the Report Wizard? Q: How many styles are in the Report Style window? Q: What is a template in the Report Builder? Q: When do you use pre-viewer in the Report Builder? Q: How do you zoon in and out in the Layout Editor? Q: What is the body section in the layout model? Q: How do you change the repeating object’s property palette? Q: Your client asks you to define a control break on their stocks symbol and company name from previous report and also to print only one company on a page. 1- Modify Hands-On report 01 to the “Group Left” style. 2- Apply template to the user report. Q: How do you use the query builder? Q: How do you generate columns label in the query builder? Q: How do you change a report’s font and size? Q: Your client has to mail their customers to inform them of the status of their current market value position. They ask you to create a report that outputs mailing labels. First they ask you to generate mailing labels with three columns and then change it to 1.5” X 3.5” label format. 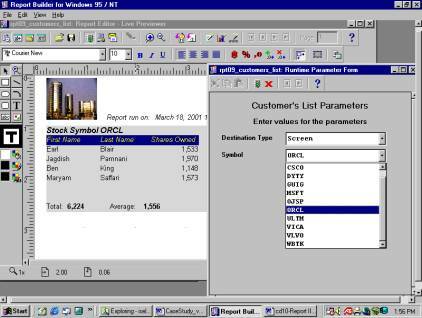 1- Create a report to generate three column labels. 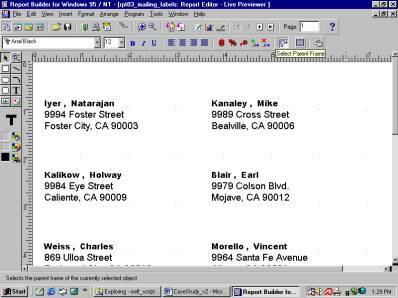 2- Extract customer’s name and address from their database. 3- Change the report to generate two column labels. 4- Apply template to the user report. Q: How do you change an object using its properties palette? Q: How can you make a sub-total for rows and columns in a matrix report? Q: You client needs to get the summary report of their customers shares owned. They like to have the output format be the same as spreadsheet format. 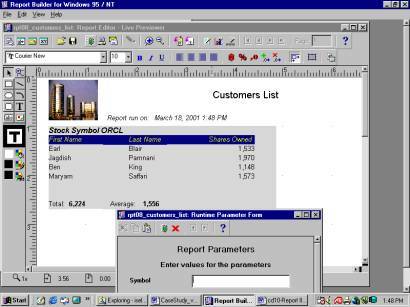 You are assigned to create a grid style of data output as a spreadsheet, with rows that present customers name and columns that present stock’s symbol. 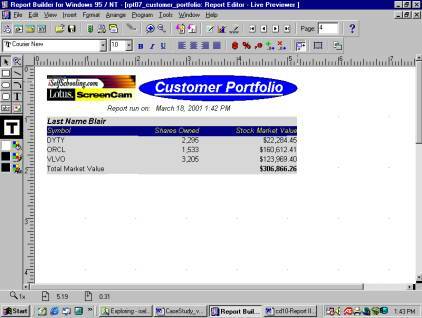 The intersection of these two entities is a cell that shows the number of shares that customer has on that stock. This report should show the number of shares of stock’s holders by each customer in each of the stocks. Make sure the cell format mask is NNN,NN0. 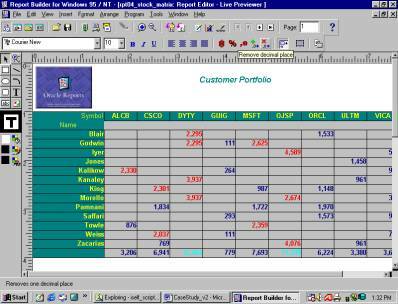 You should use the customer and portfolio table, and put grid around each number of shares for easy reading. You should also get the totals for each column and row. They want you to change the cell color to red if its value is greater than 2000 and do the same for rows and columns sub-total. 1- Create a matrix report. 2- Put grid around each cell. 3- Use user layout format mask for cells and sub-totals as NNN,NN0. 4- Calculate the subtotal for rows and columns. 5- Highlight the cells with any color (ex: red) if their values are significant. 6- Highlight the sub-total cells with any color (ex: pink) if their values are significant. 7- Apply template to the report. Q: When do you use the query builder tool? Q: How do you set a table relationship in the Layout Module? Q: How do you define a column from the Query Builder? Q: How do you use the Data Model tool? Q: How do you use the Layout Model tool? Q: Your client needs to write a letter to all its customers who own Oracle shares for good news of split of their shares. 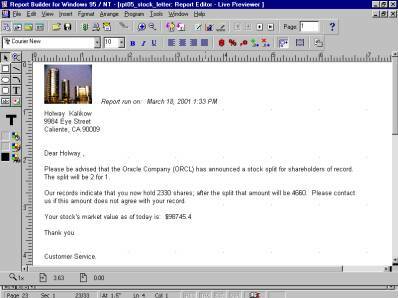 You are asked to write a “Form Letter” to send to each customer who own Oracle (orcl) shares. You are supposed to notify them of a stock split and tell them the number of shares the broker hold for them, their size of the split and the post-split amount and their current stock market values. 1- Create a “Form Letter” report. 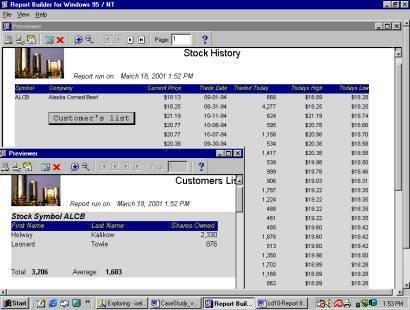 2- Extract customer’s information from their database. 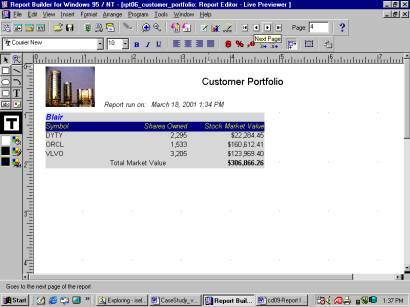 3- Generate the report only for Oracle’s share holders. Q: What is a main section in the Object navigator? Q: Your users want to send to their customers their portfolio information at the end of each month. 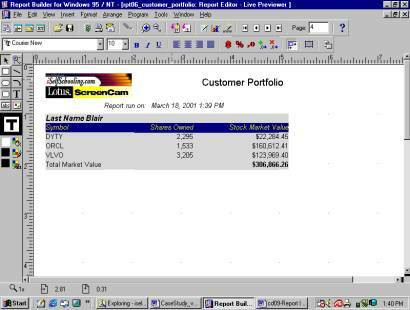 Based on their requirements, you should create a master-detail report that shows the portfolio holdings of each customer of the stock broker company, including their current stock market value. As a user requirement, you should use format mask NNN,NN0 for shares owned and $99,999.09 for their stock market value. You should also print each customer stock’s information on a separate page so company can mail them to its customer. 1- Write a “Group above” report. 2- Print detail shareholders record (symbol, shares owned, and its current market value. 3- Apply user layout Format mask. 4- Calculate the customer’s current stock market value. Q: How can you create or modify an existing template? Q: Your client needs their logo to be displayed at each new or old report. They ask you to create a template that contains their logo. Then run a report. 1- Write a template containing your client logo. 2- Run the report against the new created template. Q: The user wants to execute this report just against a specific company’s symbol. They want to use company’s symbol as a parameter to pass to the report. Also the report should calculate the total and average of shares sold for the company at the end of report. 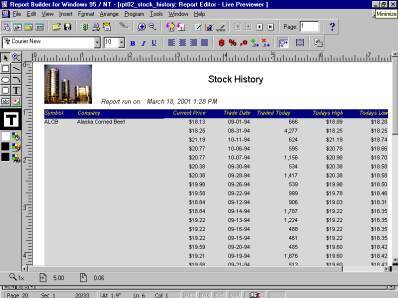 Q: You client likes what you did on the previous Hands-On and ask you to use the report on the “Stock History” report. This should give them an option to get customers list (Customers List) for each company. They ask you to create a drill down report on the company’s stock information so they get more detailed information about that company’s shareholders. Your report (Stock History) should have push button to call company’s shares holder from previous Hands-On (Customers List). The report should show for the security shown on the screen all customers of that security, the amount of their position, and the total number of shares held. 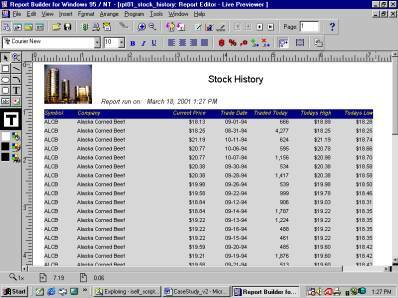 1- Modify the “Stock History” report. 2- Add the Push Button option to call the “Customers List” report. 3- Write a trigger to execute the “Customers List” report. Q: Describe a List of Values in the report module. Q: How do you modify a user parameter properties using property palette? Q: How do you use the Query Builder tool? Q: Since your parameter report is very handy for your client organization, they ask you to create a list of values (LOV) for the parameter so they can only select from the list rather than trying to remember the company symbol. Also add more parameter to pass such as the destination of printer, and so on. 1- Modify the “Customers List Parameter” Form. 2- Add LOV to the “symbol” item. 3- Add one more parameter “Destination Type” to the “customers List Parameter” Form.